Mr. Coyote? Bang – you’re dead! 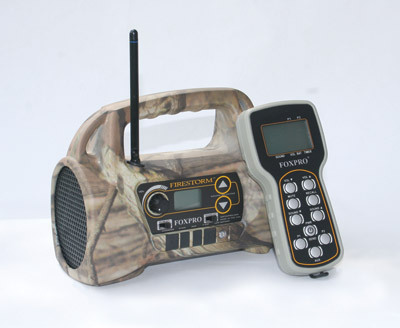 Like other FoxPro remote-control digital game callers, the FireStorm lets you switch between scores of sounds, raising and lowering volume, muting, and otherwise orchestrating the show. 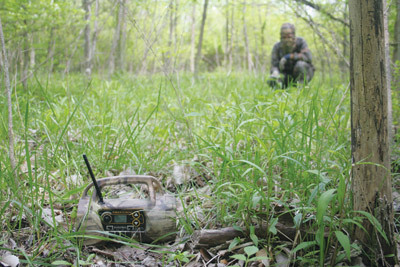 However, the latest FoxPro innovation isn’t a sound, per se, but rather a feature in the FireStorm electronics that lets you set the caller to automatically switch itself to a new sound when you fire your gun. Experienced callers know it pays to keep calling after a shot, because while critters may run, it’s in reaction to the sudden noise and not necessarily because the animals are spooked. And when the calling continues, a running critter may pause, and a pausing critter may resume its approach. When the calling sound changes quickly to a ki-yi cry or pup distress, this response is even likelier with coyotes, and FoxBang does it automatically.The FoxBang feature on our test caller worked exactly as advertised. The rabbit squeals we were playing stopped, replaced by the louder, more intense ki-yi cries we had previously selected. The FireStorm utilizes a built-in dual-amplification speaker system to produce clear sound at low or high volume. Comes programmed with 50 calling sounds, and holds up to 200. TX9 remote (standard equipment with the FireStorm) lets you preset your FoxBang sound and also one other. It displays all of the sounds programmed in the caller on a rolling backlit screen, allowing for quick selection even at night. Volume can be turned up or down. Mute button pauses any sound instantly. Recall button lets you jump back to the last sound and volume played. Other TX9 features include a battery charge indicator and a timer that tells how much time has elapsed since the caller started playing.